Delysees opened early last week on King West, billing itself as an authentic modern French bakery. A tempting claim, for sure, which motivates me to endure biking through rush-hour traffic on King to pay a visit. After catching a glimpse of the sleek interior and the croissants on display, I'm cautiously optimistic that I'm in for the real goods. My optimism grows as I chat with the owner, Fred Naggar, who grew up in Paris. Naggar studied baking in France and Toronto before then starting his career in fashion. After 10 years in the fashion industry, including six years working in LA as a brand manager for the denim line Rock & Republic, "I wanted to come home," he explains. He decided to return to his roots of baking and directly engaging with customers. His background in fashion is reflected in the bakery's decor, which Naggar describes as "clean, modern, and contemporary." 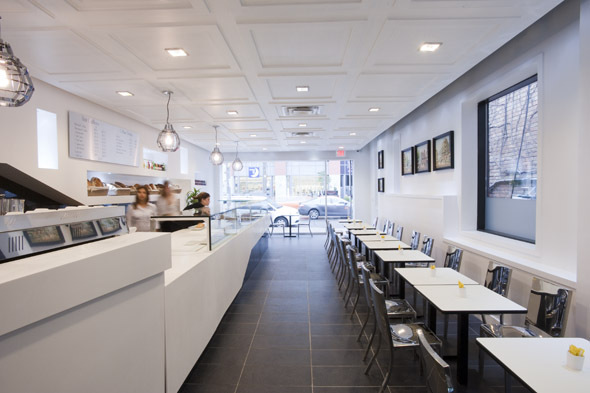 The spacious white interior is accented with stainless steel light fixtures, while sleek white tables and simple metal chairs provide ample seating. Soothing French music plays in the background, and paintings of Parisian street life add a hint of colour to the walls. 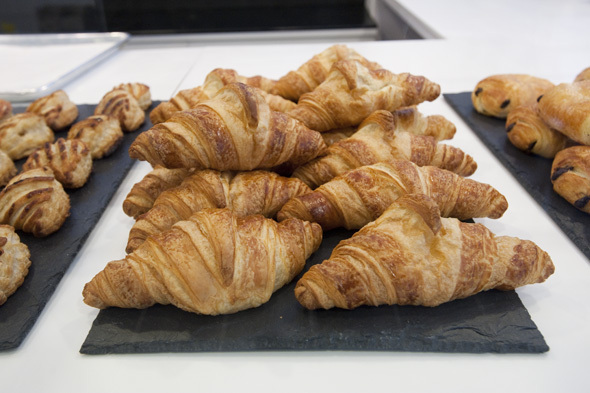 The modern atmosphere is the perfect backdrop for the baked goods and sandwiches, all made on site and artfully displayed on simple white and slate platters. 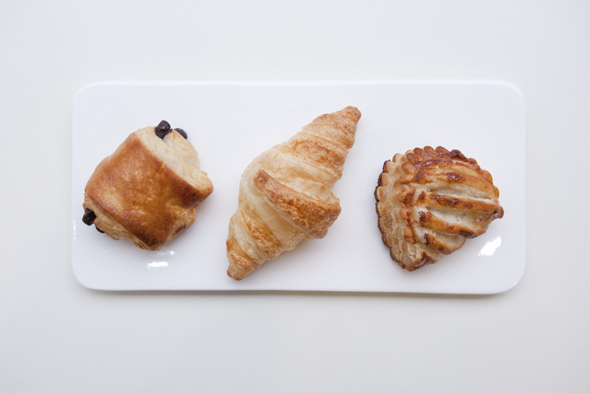 Delysees serves up pastries like croissants and raisin rolls, as well as mini-mousses and French macarons. They also offer gourmet mini-sandwiches for a quick savoury snack, and freshly baked breads and baguettes. A variety of beverages, including espresso-based drinks, brewed coffee, tea, and sodas, are available to accompany your treat. Naggar explains that he wants to bring to the neighbourhood a "local French bakery that's exquisite," with a focus on high-quality service and fine food. He very diplomatically avoids critiquing Toronto's bakeries, but says he wants to offer "smaller portions with a finer quality." No margarine in these croissants, mes amis , only quality butter (read: creamy and calorie-laden). Now, let's talk about the croissants ($2.45 for plain, $2.65 for chocolate). Served on a simple white plate, my golden brown and flaky croissant is almost too pretty to eat. Almost. The scent of rich butter hits my nose as I go in for a bite. The moist and airy dough melts in my mouth, and even though it's after 6pm, there's no hint of staleness. If the full size seems a bit too indulgent for you, mini varieties are also available ($1.25). 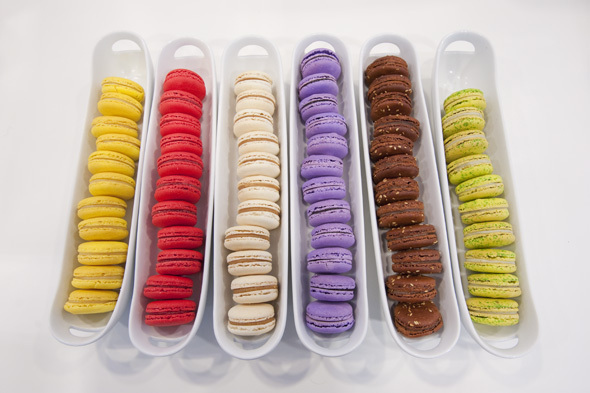 Next up, I have to try a couple macarons, neatly displayed in rows of soft hues and vibrant colours ($2.25 each). Naggar rotates the flavours for sale, offering both classic and more creative varieties like vanilla, pistachio, blueberry lavender, chocolate sesame, and orange blossom. Based on his recommendation, I start with the intriguing lime basil flavour. The delicate cookie has a perfectly smooth, soft green coloured shell with a moist and slightly chewy interior. The sweet lime flavour from the fruit filling is subdued by a mild basil taste that comes through. I follow it up with their most popular macaron, the salted caramel, which delivers a rich flavour in a couple satisfying bites. Naggar says they sold about 400 to 500 macarons daily in their first few days, and it's not hard to understand why. These dainty treats offer a hint of sweet flavour without being too heavy or sugary, and feel far more special than your typical cookie or vending machine snack. During my visit, several passersby pop in to grab a macaron (or two, or four) as a little weekday reward on the way home from work. After finishing my nutritious dinner of multiple baked goods, I hang out to enjoy the free wi-fi and soothing sounds of Edith Piaf . It's obvious that Delysees has generated some neighbourhood buzz since it opened, as I watch locals stop in to check it out for the first time. With its sleek yet welcoming atmosphere and quality treats, King Westers are sure to enjoy escaping the sounds of traffic and construction, and indulging in a little taste of Paris at this new spot. EDITOR'S NOTE: We regret that this post wasn't edited properly the first time through. 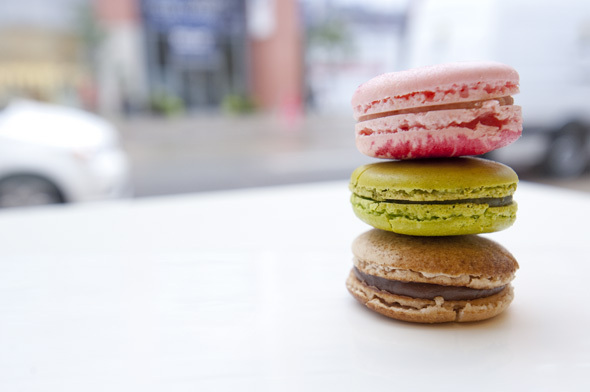 The post has now been updated with the proper spelling of macarons. Delysees is open Sundays to Wednesdays 7am to 8pm, and Thursdays to Saturdays 7am to 10pm.